Position a rack in the top third of the oven, and heat the oven to 425 F. Line a large baking sheet (or two) with parchment paper or a silicone mat. Heat the milk and 4 tbsp butter in a medium saucepan over medium-high heat, stirring occasionally to keep the bottom from burning. When the mixture is simmering and the butter is melted, remove from the heat and add the flour, salt, and pepper all at once. Stir well with a wooden spoon to combine. Return the pan to medium heat and stir hard for 1 to 2 minutes, until the mixture thickens further and becomes stiff. Transfer the mixture into a bowl of the stand mixer fitted with the paddle attachment. Mix the dough on medium speed for a minute to cool the dough slightly. Break the eggs into a liquid measuring cup or a bowl, lightly whisk with a fork. Add the eggs gradually, in 4-5 additions beating well after each portion has been added to incorporate it into the dough. Remove the bowl from the mixer base. Chop the thyme finely and add to the cheese mixture and blend it in at the end with a wooden spoon. They were not overly salty but you can add a little salt to the mortar and pestle with the thyme to crush it, or on the cutting board to scrap and chop so aromatics are released. Transfer the mixture to a pastry bag with a large plain tip. The mixture will still be warm. Pipe the mixture onto the prepared baking sheets in mounds about 1 inch in diameter, leaving a couple of inches between them. Smooth out any points with a wet finger. Unbaked gougères can be frozen on the baking sheets. Once the dough is completely frozen, transfer the piped shapes into freezer bags. They can be kept in the freezer for up to a week. Put one baking sheet into another to isolate the pastry bottoms from strong heat and slide the baking sheet into the oven. Bake for about 12 minutes, until the gougères are well puffed. Reduce the oven temperature to 375F and continue baking until golden brown, 10 to12 minutes more. Let them cool slightly on the baking sheet. If baking the previously frozen pastries, there’s no need to completely defrost them before baking; just let the frozen gougères sit on the baking sheet on a counter while the oven is preheating. For the filling I added some lemon zest and black pepper to some goat cheese whisking it with a bit of sour cream, yogurt or creme fraiche for a smooth filling. 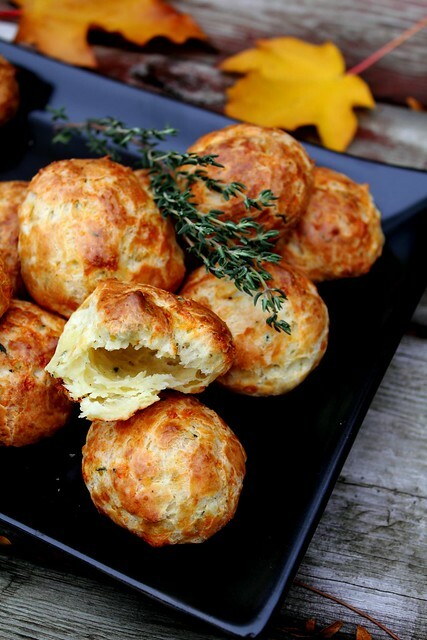 I've never had gougeres before but these look fantastic. Kaloian, thank you! They were great on their own but that zesty filling just totally elevated it and the lemon zest just brought out the thyme. Vegolicious, thank you for visiting! Thanks so much for your lovely posts. I really want to showcase how fantastic vegetarian food can be and your dishes definitely help show that. I'd love for you to submit any future vegetarian dishes. Also, visit our sister site www.bakeolicious.com to showcase your delicious baking. those are beautiful and I just bet they taste as good as they look! I might even go the extra mile to make them. Sue, you'll love 'em!! It took me about an hour from start to finish. Wasn't that bad, just keep an eye on them in the oven. I love food that has surprised inside, this is way cool! I am famished and now want these NOW! Gosh pictures are so yummy. We've selected you as our Foodista Food Blog of the Day for November 8th! 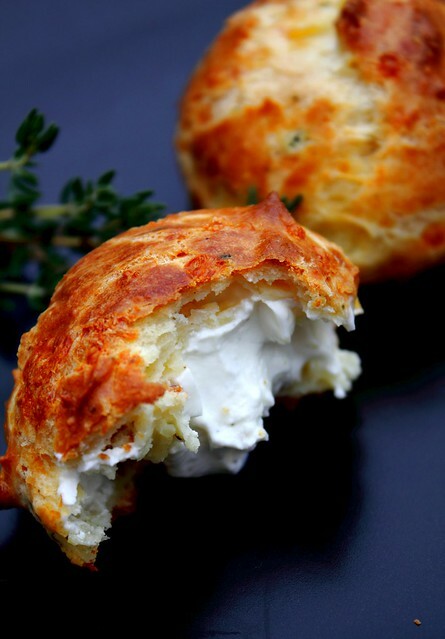 This post for cheddar-thyme gougeres will be featured on the Foodista homepage for 24 hours. Since you are now a part of the Foodista Featured Blogger of The Day Community, we've created a special badge for you to display proudly on your blog sidebar. I couldn't find your email on your blog to send you the access code for the special badge, but I want to make sure you get it if you are interested. Please send me an email and I'll send it right away. I want to make these tomorrow, but noticed in the body of the recipe you to Dijon mustard, dry mustard & cayenne pepper. These ingredients are not listed in the recipe. How much of each of these do I need? How much thyme and goat cheese did you use for this recipe? Also, how/when did you pipe in the goat cheese filling? Thanks! I would not fill them all as they'll get mushy. See how many cream puffs you ended up with and then how many guests you have and if you're going to serve them immediately then fill them all probably using 1/2- 2/4 of the large goat cheese tube. Use 2 sprigs of thyme, 1/4 tsp lemon zest and mix it all with some yogurt/sour cream to make a nice cream like consistency. Good luck, hope it works out. Always pipe in the filling when shells are cooled and just when you're ready to serve. I fixed the recipe, as for the source I can't locate the page either, unfortunately. I was really excited to make these...but very disappointed in the instructions and how to make the filling and piping it in. So where do I go now for complete instructions? Use a paring knife to prick a hole in the bottom of each of the gougeres and with a pastry bag filled with the filling) pipe a small amount inside then remove the top and set onto a plate. Filling: Whisk your goat cheese until smooth, add some sour cream or yogurt to lighten it up and flavour with desired herbs (lemon zest, chopped chives..etc. ) season with black pepper and salt and voila!